The 1st of two courses at beautiful Cachuma Lake off the 154. Concrete tees and orange powder coated Mach 5s. Each hole has 4 pin placements - can be set up to challenge the recreational player or seasoned pro. Fee; $10/car/day to get into the park. Two 9 hole loops begin and end very close to the park store. There is a 6 minute walk from #13 to #14. Bathrooms after #1, 7, 10 and 13. Added contact: Hugh Montgomery 805-705-1200. 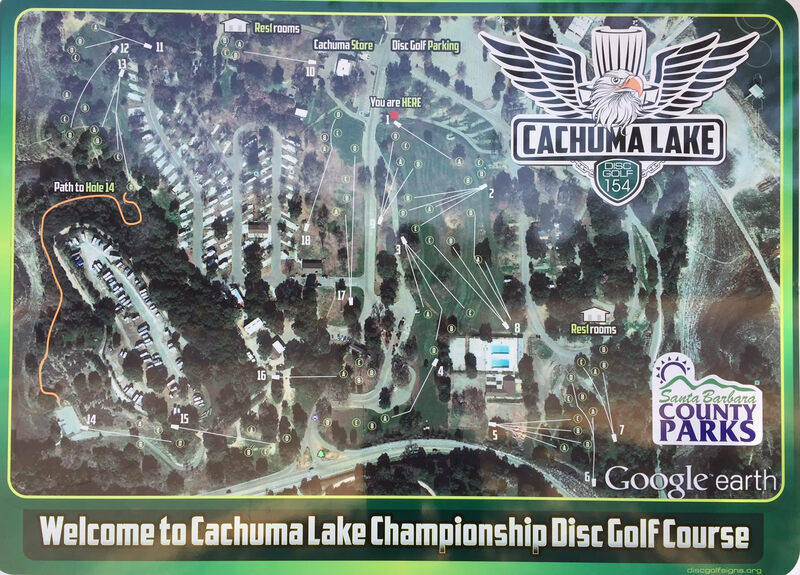 Off the 101 freeway either North or South, take the 154 to the entrance to Cachuma Lake. 1st tee near the camp store. New course in the summer of 2017 with all new concrete tee pads and new baskets at four possible placements for each hole. The course map at the start shows all placements and the tee pads now all have a map of the hole with an indication of the current basket position. Some of the ground is rough and hilly but the entire course is well maintained. Great new addition to the central coast area. Course pictures available once OK given for posting.